Goodebox is a subscription service that ships you a small box of “expertly curated, trial sized healthy, eco-sensitive & effective beauty and personal care products, along with occasional samples of natural & organic health and wellness products.” If you completely fill out your online profile, they’ll customize the contents even more. Right now I’m signed up to receive a box every other month. So far, I’m pretty pleased. Like all subscription box services, every box isn’t **amazing**, but I’ve gotten to try some green/clean products I’ve been eye-ing for a while, and I’ve been introduced to new brands and products. Which is the point, right? The number one reason I like subscription services is that you get sample sizes of a lot of different products that you might otherwise never try. Since I’m transitioning all of my products to green/clean/non-toxic ones, sample sizes for trial are ideal. 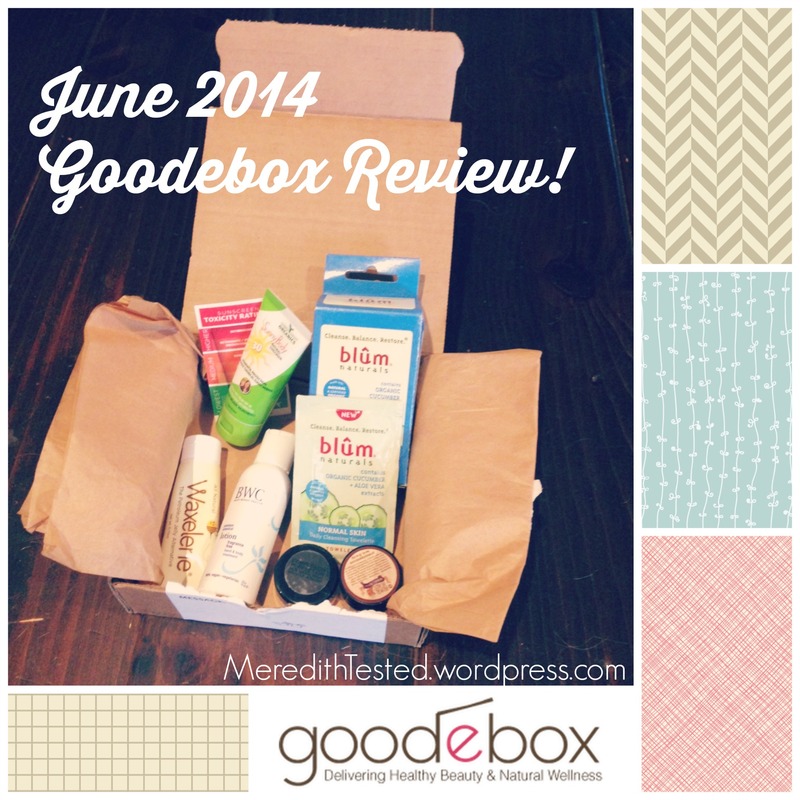 My June Goodebox contained some fantastic samples. My review of each is below. I’m no stranger to cleansing wipes, so I was excited to see these. My favorite part was the individual packaging. Not super environmentally friendly but very convenient – throw them in your purse, makeup bag, gym bag. I found the texture of the towelettes a little on the rough side for my sensitive skin so I wouldn’t use them every day. However, the formula was great – it removed my makeup and wasn’t too drying. Use a moisturizer right after and you’re good to go! Super basic, you might even think “boring” but this lightweight lotion is divine. Absorbs quickly and makes my skin super soft, ahhhhh. I’m so excited about this – I have fair, Scandinavian skin and need sunscreen year-round. I so far really love this sunscreen – it applies just like the sunscreen you’ve always used, just toxin-free! I also LOVE the little card that Goddess Garden sent that gives ingredients from bad to good so you can check the sunscreen already in your medicine cabinet. This has been on my “deodorants to try” list for SO long, I was thrilled to see it in my box. My small sample lasted 4+ days and I love it so far. I am ordering a full size for sure! I think I’ll try the stick instead of the jar, just to make application easier. Another product I’ve been meaning to try for a while. All of the hype is for good reason. This stuff is amazing on your lips or anywhere you feel dryness. I immediately threw this in my purse and plan to use it all the time. Will repurchase as soon as my tube is out. UPDATE: Due to my soy intolerance, I’ve had to discontinue use of this product. Silly me, not reading the ingredient list! Hell-o! I got a little bit of an allergic reaction – itchy lips and some redness – every time I use this. So bummed out! Hopefully I’ll be OK living vicariously through everyone without soy issues who can use this awesome product. Do you like subscription boxes? Why or why not?